Rob finds true joy in helping clients succeed financially. His personality, knowledge and guidance combine to provide a unique experience for the client’s he serves. With more than 17 years of industry experience, Rob attributes his success to staying true to his core principles of holistic financial planning and looking after his clients financial interests with the same care and consideration he uses to manage his own. 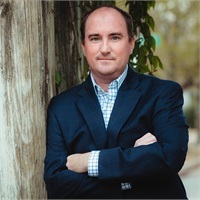 Rob has a finance degree from the University of Arkansas Walton School of business, he holds the prestigious CERTIFIED FINANCIAL PLANNER™ designation granted by the Certified Financial Planner Board of Standards and the Certified Wealth Strategist® designation awarded by the Cannon Financial Institute. Rob, his wife Laney, and their two children have lived in Springdale Arkansas for over 8 years. They love the North West Arkansas area and are involved in several community and charitable organizations. Rob enjoys rooting on his Razorback athletic teams, traveling, and an occasional round of golf. On a free weekend, you’ll likely find Rob and the whole family on a camping trip, or around town supporting their kids events and activities.